The Marylebone Road’s once bleak pedestrian underpass outside Baker Street Station has been transformed into an intriguing Wonderpass. Gone are the dingy walls and unreliable lighting: in its place is an engaging cultural walkway, offering pedestrians an enlightening way to cross the road. Part optical illusion, part local encyclopedia, part gallery, The Wonderpass introduces a new kind of urban crossing – one that actually encourages lingering en route. Working in partnership with Sing London, Bigg Design created the overarching concept and detailed design for the Baker Street Wonderpass, based upon themes of Victorian peep shows, showmanship, vintage funfairs and a strong sense of the theatrical. 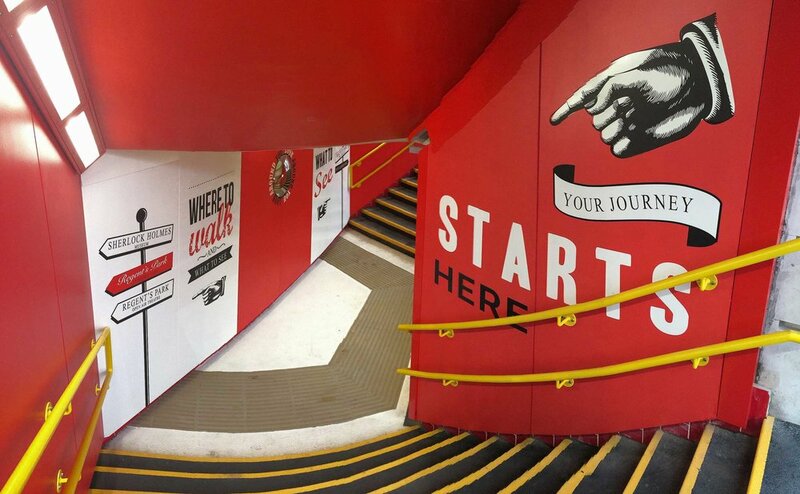 The bold red and white spiral visually distorts the tunnel, whilst providing a novel canvas for the fun facts and innovative display cabinets - the contents of which can be changed over time, ensuring continued interest over time. Bigg Design also created the Baker Street Underground Station display cabinet and peep holes. Inspired by Victorian-era dioramas, paper theatre and shadow boxes, and based on the fact that it was one of the world’s first underground railway stations, we produced 3D model dioramas from 19th Century engravings of the station, using a mixture of advanced digital manipulation, computer and physical model making. Viewers can now peer in through the display cabinet and peep holes to see a unique representation of history. The Wonderpass has been commissioned by the Baker Street Quarter Partnership and funded by Transport for London and Westminster City Council through the Bryanston & Dorset, Marylebone High Street and Regent’s Park Ward contributions.